Ernie Merrick kept with the same side and formation from Monday night’s 3-2 defeat to Melbourne Victory, with Louie Fenton continuing in his new role at right-back. After a fortunate 1-0 win over Sydney FC last week, Alistair Edwards rejigged the centre of his attack. Steven McGarry was pushed forward in behind Shane Smeltz, who made his first start of the season along with Cameron Edwards, who took up McGarry’s usual position in deep midfield. This was not a particularly high-tempo or high-scoring game, although both coaches’ attempts to evolve their sides towards a new style of play was an interesting feature. Starting with the home side, who have generally impressed under Merrick but are still yet to win under the new regime – after initially experimenting with a 4-2-3-1, it appears Merrick now favours a 4-3-3 in the truest sense of the shape. Out of possession, the formation is very ‘flat’: there’s the back four, then a line across the midfield – Vince Lia, Manny Muscat and Albert Riera – who tuck in closer together than the front three. Stein Huysegems, Jeremy Brockie and Carlos Hernandez switch positions fluently, but generally it’s left, right and centre forward respectively. They form the first line of defensive pressure, and stand off to prevent easy passes being played forward into the midfield zone – but when the ball is worked beyond them, they are absolved of defensive responsibility, and the two strikers position themselves in the channels, ready for counter-attacks. Before considering the ramifications of those instructions, it’s worth noting the changes Edwards has made to a Perth side that played a more direct, crossing-based game under his predecessor, Iain Ferguson. One of Edwards’ main changes upon taking over was to emphasise more possession play, and that was particularly obvious here as they looked to build attacks very patiently from deep positions. Jacob Burns and Cameron Edwards took turns to drop in between the centre-backs and often went unchallenged, and it’s unsurprising that they, Steve Pantelidis and Michael Thwaite finished as Perth’s most frequent passers. The combinations between Vukovic and Edwards to Pantelidis was also the most recurrent for the pass combination statistic. Much of the first forty-five minutes was dominated by Perth’s slow build-up inside their own half, with lots of square balls across the back. Often, the out-ball was down the sides, where one of the full-backs, with no direct opponent, was regularly free to carry the ball forward. That was the negative consequence of Wellington’s system. Scott Jamieson’s link-up play with Sidnei was often the full-back simply knocking the ball down the line, with none of the three Wellington forwards putting him under any pressure. From there, Sidnei could receive the ball facing forwards in front of his direct marker, Fenton, and the Brazilian’s directness on the ball was the game’s most promising source of creativity, frequently driving past the defender with power and speed. Unsurprisingly, having gone behind to a set-piece, Perth equalised through Sidnei dribbling past Fenton, before squaring for Ryo Nagai to finish from close range. Nagai and Sidnei switched midway through the half – odd, given how much trouble the latter was giving Fenton. It summed it up that he was substituted at half-time – he was clearly Wellington’s weak link. The positive consequence of Wellington’s 4-3-3, though, was that the Brockie and Huysegems were always in positions to receive the ball quickly on the break – the passes they received appear long and direct on the diagram below, but were often simply clever ground balls from teammates who could pick them out quickly at transitions. Huysegems in particular looked to drive from wide left positions towards goal, cutting across the inside of his defender into the space between Perth’s centre-backs and full-backs. The main issue, though, was with the quality of the final ball – often underwhelming, and with Hernandez off his game, meant the Phoenix seemed overly reliant on counter-attacks. Instead, the game increasingly became about Perth’s possession. The introduction of Jason Hicks at half-time meant Manny Muscat moved back to the right-back position he played for the majority of last season, and he coped well with Sidnei’s dribbling. Instead, the main attacking threat was now oming through crosses from the full-backs, with Jamieson and Matthew Davies moving free into the final third unchallenged and sending in a stream of lofted crosses into the penalty area. It was difficult for Smeltz to properly attack them, as he was easily marked by the two Wellington centre-backs, but McGarry often connected with crosses as a late runner from midfield, twice volleying over from close range. I’ve written more about that particular issue at FourFourTwo. Edwards’ substitutions effectively returned the side towards the personnel he’d favoured in the opening four rounds, as McGarry dropped deeper to accommodate Jamie MacLaren and Ryan Edwards in the central attacking positions. Herbert, meanwhile, unsurprisingly introduced Paul Ifil – but the Kiwi didn’t provide the same attacking spark that he did against the Wanderers and the Victory. 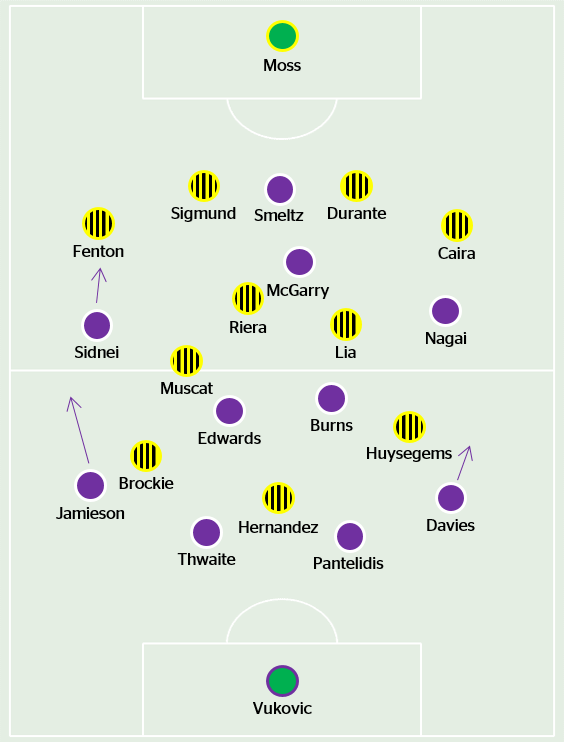 Durante’s goal, coming so early in the match, was alien from the rest of the tactical battle, where Wellington were happy to allow Perth time on the ball in deep positions – but struggled to deal with the one promising avenue that the possession was creating, through Sidnei down the left. Hooking Fenton at half-time was a successful move – and reinforced the feeling that Merrick isn’t afraid to make early changes if necessary – but it took Muscat out of midfield, a position the new coach has been keen to keep him in after years of switching the position. Fenton has now been targeted twice in successive weeks by Melbourne Victory and now Perth – it’ll be interesting to see which right-back Merrick opts for next week against Adelaide.